The Lancet Countdown is a unique research collaboration between 24 international academic institutions and inter-governmental organisations. It monitors progress on the relationships between health and climate change, and their implications for national governments. The Lancet Countdown reports annually, making recommendations for activity to mitigate climate change. The 2015 Lancet Commission on Health and Climate Change—which assessed responses to climate change with a view to ensuring the highest attainable standards of health for populations worldwide—concluded that “tackling climate change could be the greatest global health opportunity of the 21st century”. The Commission recommended that more accurate national quantification of the health co-benefits and economic impacts of mitigation decisions was essential in promoting a low-carbon transition. Building on these foundations, the Lancet Countdown: tracking progress on health and climate change was formed as an independent research collaboration. The Lancet Countdown is dedicated to tracking progress on the world’s response to climate change, as currently shaped by the Paris Agreement, and the health benefits that result through annual publication of a series of indicators. 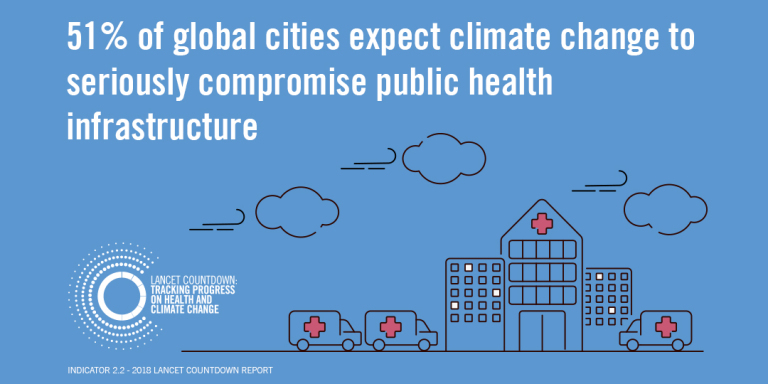 The Lancet Countdown raises awareness of the connections between climate change and health to demonstrate how activity to mitigate climate change can also have significant outcomes in addressing global health challenges. Steve Pye, Principal Research Associate at the Bartlett School of Environment, Energy and Resources, UCL and colleagues, Dr Nick Watts, UCL Institute for Global Health, Executive Director of the Lancet Countdown and Dr Ian Hamilton, Reader in Energy Epidemiology, Bartlett School of Environment, Energy and Resources are part of the Wellcome Trust funded team which tracks 41 indicators across five key domains across health and climate change. The Lancet Countdown is focused on better communicating the opportunities available in responding to climate change for health. The Wellcome Trust is a strategic partner with the Lancet for the Lancet Countdown, providing financial and technical support for its work. The partnership comprises 24 academic institutions from every continent, bringing together individuals with a broad range of expertise across disciplines (including climate scientists, ecologists, mathematicians, geographers, engineers, energy, food, and transport experts, economists, social and political scientists, public health professionals, and physicians). Four of the indicators developed for Working Group 3 (Mitigation actions and health co-benefits) uses International Energy Agency (IEA) data made available by the the IEA via the UK Data Service for use by researchers, learners and teaching staff in UK higher and further education. Additionally, two of the indicators developed for Working Group 4 (Finance and economics) also use IEA data. Read our impact case study to find our more about the impact and reach of the Lancet Countdown, watch the YouTube film below, read the Lancet Countdown 2018 Report and follow the Lancet Countdown on Twitter.